As I mentioned in my previous article here, demonstrations can turn violent at any given time. Freedom dictates responsibility. The image of that protester is an eyesore to say the least. 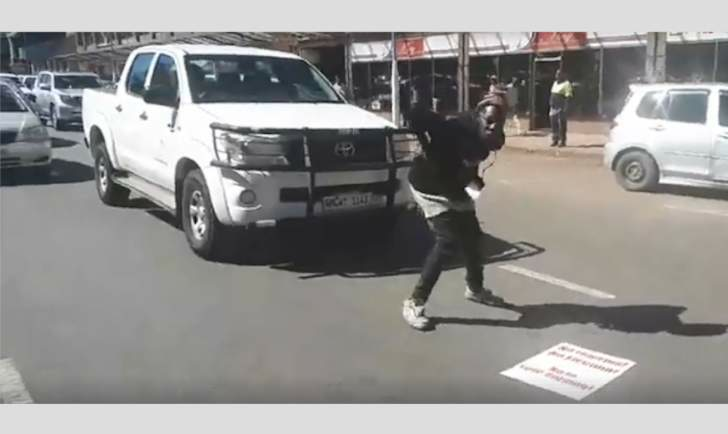 This clown disturbed the flow of traffic and what do you think would have happened if the drivers got out and beat him up? In a democratic society where freedom prevails, people are allowed to be stupid as long as they don't interfere with other people's freedoms. Anyone who disturbs another person's freedom must face the consequences. The police must keep a sharp eye on these disturbances and pick and lock these confused chaps. The arrests must be made during or after the marches; all of us must play fair by the rules. As peace loving citizens, we are also going to arrange counter demonstrations to defend our freedoms if the police don't do their job. We will not sit back and let our lives be defined by these misguided and confused people.